There is a deep rift between the outside world  which is clamoring for the return of democratically elected, but largely unpopular and soon-to-leave-office President Manuel Zelaya  and congressionally designated successor Roberto Micheletti. Micheletti rejected any outside interference and declared a two-night curfew, while Chavez vowed that "we will overthrow (Micheletti)." Zelaya was seized by soldiers and hustled aboard a plane to Costa Rica early Sunday, just hours before a rogue referendum Zelaya had called in defiance of the courts and Congress, and which his opponents said was an attempt to remain in power after his term ends Jan. 27. The Honduran constitution limits presidents to a single 4-year term, and Zelaya's opponents feared he would use the referendum results to try to run again, just as Chavez reformed his country's constitution to be able to seek re-election repeatedly. Micheletti said the army acted on orders from the courts, and the ouster was carried out "to defend respect for the law and the principles of democracy." But he threatened to jail Zelaya and put him on trial if he returned. Micheletti also hit back at Chavez, saying "nobody, not Barack Obama and much less Hugo Chavez, has any right to threaten this country." CBS News producer Portia Siegelbaum in Havana reports that Zelaya's foreign minister, Patricia Rodas, was also kidnapped by uniformed soldiers wearing black hoods and taken to an air base near Tegucigalpa. A plane carrying Rodas left Honduras late Sunday night for Mexico, where she was to be met by Mexican President Felipe Calderon. The announcement was made by Nicaragua President Daniel Ortega, who said the information came from the Nicaraguan Embassy in Mexico. Ortega is chairing the meeting of Latin American presidents in Managua in support of Zelaya, who is also attending. Earlier, Obama said in a statement he was "deeply concerned" about the events, and U.S. Secretary of State Hillary Clinton said Zelaya's arrest should be condemned. Two senior Obama administration officials told reporters that U.S. diplomats were working to ensure Zelaya's safe return. The officials said the Obama administration in recent days had warned Honduran power players, including the armed forces, that the U.S. would not support a coup, but Honduran military leaders stopped taking their calls. Zelaya said soldiers seized him in his pajamas at gunpoint in what he called a "coup" and a "kidnapping." The United Nations, the Organization of American States and governments throughout Latin America called for Zelaya to be allowed to resume office. "I want to return to my country. I am president of Honduras," Zelaya said Sunday before traveling to Managua on one of Chavez's planes for regional meetings of Central American leaders and Chavez's leftist alliance of nations, known as ALBA. Zelaya's call for civil disobedience and peaceful resistance appeared to gain only modest support in Honduras, where a few hundred people turned out at government buildings to jeer soldiers and chant "Traitors!" Some of Zelaya's Cabinet members were detained by soldiers or police following his ouster, according to former government official Armando Sarmiento. And the rights group Freedom of Expression said leftist legislator Cesar Ham had died in a shootout with soldiers trying to detain him. A Honduran Security Department spokesman said he had no information on Ham. 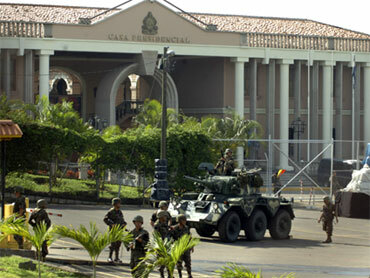 Armored military vehicles with machine guns rolled through the streets of the Honduran capital and soldiers seized the national palace, but no other incidents of violence were reported. Sunday afternoon, Congress voted to accept what it said was Zelaya's letter of resignation, with even the president's former allies turning against him. Micheletti, who as leader of Congress is in line to fill any vacancy in the presidency, was sworn in to serve until Zelaya's term ends. Micheletti acknowledged that he had not spoken to any Latin American heads of state, but said, "I'm sure that 80 to 90 percent of the Honduran population is happy with what happened today." And Taiwanese President Ma Ying-jeou canceled a planned visit to Honduras, one of just 23 countries that still recognize the self-governing island.